It's a well-kept secret, but 95 percent of the climate models we are told prove the link between human CO2 emissions and catastrophic global warming have been found, after nearly two decades of temperature stasis, to be in error. It's not surprising. In January 1970, Life magazine, based on "solid scientific evidence," claimed that by 1985 air pollution would reduce the sunlight reaching the Earth by half. In fact, across that period sunlight fell by between 3 per cent and 5 per cent. In a 1971 speech, Paul Ehrlich said: "If I were a gambler I would take even money that England will not exist in the year 2000." Fast forward to March 2000 (in England) and David Viner, senior research scientist at the Climatic Research Unit, University of East Anglia, told The Independent, "Snowfalls are now a thing of the past." In December 2010, the Mail Online reported, "Coldest December since records began as temperatures plummet to minus 10C bringing travel chaos across Britain." We've had our own busted predictions. Perhaps the most preposterous was climate alarmist Tim Flannery's 2005 observation: "If the computer records are right, these drought conditions will become permanent in eastern Australia." Subsequent rainfall and severe flooding have shown the records or his analysis are wrong. We've swallowed dud prediction after dud prediction. What's more, the (UN) Intergovernmental Panel on Climate Change, which we were instructed was the gold standard on global warming, has been exposed repeatedly for misrepresentation and shoddy methods. Weather bureaus appear to have "homogenized" data to suit narratives. NASA's claim that 2014 was the warmest year on record was revised, after challenge, to only 38 per cent probability. Extreme weather events, once blamed on global warming, no longer are, as their frequency and intensity decline. Why then, with such little evidence, does the UN insist the world spend hundreds of billions of dollars a year on futile climate change policies? Perhaps Christiana Figueres, executive secretary of the UN's Framework on Climate Change has the answer? In Brussels last February she said, "This is the first time in the history of mankind that we are setting ourselves the task of intentionally, within a defined period of time, to change the economic development model that has been reigning for at least 150 years since the Industrial Revolution." Figueres is on record saying democracy is a poor political system for fighting global warming. Communist China, she says, is the best model. This is not about facts or logic. It's about a new world order under the control of the UN. It is opposed to capitalism and freedom, and has made environmental catastrophism a household topic to achieve its objective. Figueres says that, unlike the Industrial Revolution, "This is a centralized transformation that is taking place." She sees the US partisan divide on global warming as "very detrimental." Of course. In her authoritarian world there will be no room for debate or disagreement. Make no mistake, climate change is a must-win battlefield for authoritarians and fellow travelers. As (former US Senator, D-CO) Timothy Wirth, president of the UN Foundation, says: "Even if the climate change theory is wrong, we will be doing the right thing in terms of economic and environmental policy." Having gained so much ground, eco-catastrophists won't let up. After all, they have captured the UN and are extremely well funded. They have a hugely powerful ally in the White House. They have successfully enlisted compliant academics and an obedient and gullible mainstream media -- the ABC and Fairfax in Australia -- to push the scriptures regardless of evidence. And they will keep mobilizing public opinion using fear and appeals to morality. UN support will be assured through promised wealth redistribution from the West, even though its anti-growth policy prescriptions will needlessly prolong poverty, hunger, sickness and illiteracy for the world's poorest. Figueres said at a climate summit in Melbourne recently that she was "truly counting on Australia's leadership" to ensure most coal stayed in the ground. Hopefully, like India's Prime Minister Narendra Modi, Tony Abbott isn't listening. India knows the importance of cheap energy and is set to overtake China as the world's leading importer of coal. Even Germany is about to commission the most coal-fired power stations in 20 years. There is a real chance Figueres and those who share her centralized power ambitions will succeed. As the UN's December climate change conference in Paris approaches, Australia will be pressed to sign even more futile job-destroying climate change treaties. In December 2012, the environmental scientist Jesse Ausubel of Rockefeller University Dr.ew my attention to a video online of a lecture given by Ranga Myneni of Boston University. It was entitled A Greener Earth? Carbon dioxide, along with water, is the raw material that plants use to make carbohyDr.ates, with the help of sunlight, so it stands to reason that raising its concentration should help plants grow. Zaichun ZhuAs Myneni’s co-author Zaichun Zhu, of Beijing University, puts it, it’s equivalent to adding a green continent twice the size of mainland USA. Ridley101916_GreeningIf that’s a clear and prominent statement that carbon dioxide emissions have increased green vegetation on the planet by 14% and are significantly reducing the water requirements of agriculture, then I’m the Queen of Sheba. All these predictions have also failed so far.The death toll from droughts, floods and storms has been going down dramatically. Not because weather has got safer, but because of technology and prosperity. James Hansen in 1988 said that by the year 2000, “the West Side Highway will be under water. And there will be tape across the windows across the street because of high winds. And the same birds won’t be there.”The UNEP predicted in 2005 that by 2010 there would be 50 million climate refugees. In 2010 it tried to delete the web link. Ten years ago, Al Gore said that within ten years we would have reached the point of no return. We haven’t. Ridley101916_Chart12That is to say there is a consensus that the models are exaggerating the rate of global warming. Ridley101916_Chart13Notice also that the warming has been twice as fast in the Northern hemisphere as the southern, that it has been concentrated in colder areas, colder seasons and at night. The difference between the red and blue lines on this chart is 20 years of global warming. Ridley101916_Chart14Notice too that the warming has definitely not taken us into uncharted territory. We are in the cooling part of the current interglacial, as shown by Greenland’s ice cores, and tree lines in the Urals are still lower than they were in the middle ages. Ridley101916_Chart15The latter are hopelessly contaminated by failures to correct properly for urbanization around measuring stations and a habit among those who control these data sets of “adjusting” old temperatures downwards without giving good reason. Ridley101916_Chart16We think recent warming was mainly caused by a change in the composition of the atmosphere, an increase from 0.03% to 0.04% carbon dioxide. Ridley101916_Chart17The sensitivity of the atmosphere to CO2 is about 1.2C per doubling. 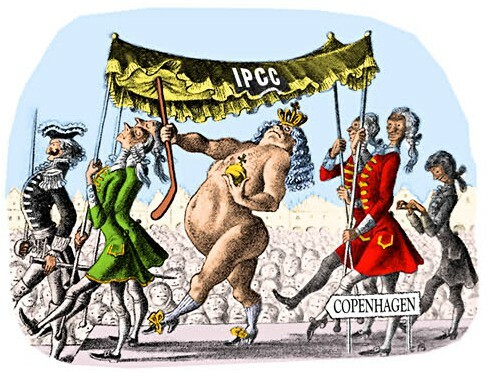 That is the consensus, spelled out clearly (if obscurely) by the IPCC several times over the years. And that’s what we are on course for at the moment. Ridley101916_Chart18This is where the evidence is much more shaky. Some studies find an increase in water vapor high in the atmosphere, others do not. One complication is that water vapor condenses into clouds and we cannot either measure or model clouds anything like adequately yet. Ridley101916_Chart19Of particular note, the cooling effect of sulphate aerosols is smaller than thought, so cannot be an excuse for the slowness of recent warming. It is beyond question that global warming has generated enormous research funds, measured in many billions, that this has stimulated all sorts of scientists, from botany to psychiatry, to link their work to climate change, and that almost none of this money flows to those with skeptical views. Suppose they do indeed experience carbon dioxide levels of 600 parts per million or more, but do not experience dangerous global warming, or more extreme weather, just a mild and decelerating increase in global average temperatures, especially at high latitudes, at night and in winter, accompanied by spectacular global greening and less water stress for both people and crops. Matt Ridley is the author of The Rational Optimist, and as 5th Viscount Ridley is a Member of the British House of Lords. His latest book is The Evolution of Everything: How New Ideas Emerge.